Episode #88: Happy Birthday, Otto Binder! Otto Binder was born on August 26, 1911 in Bessemer, Michigan and died on October 13, 1974 at the age of 63. During a long and prolific career as a comic book writer he co-created much of Superman's silver age universe. Among the characters he helped add to Superman's world were Krypto, Brainiac, Bizarro, Jimmy Olsen as Elastic Lad, Titano, Beppo the Super Monkey, Lucy Lane, Supergirl and his longest lasting contribution, the Legion of Super-Heroes. Watch for FANBOY RADIO episode #521 with Michael Uslan. He tells a story about personally knowing Otto Binder. FANBOY RADIO's web site is http://fanboyradio.com . Episodes are also available on iTunes. Join the SUPERMAN FAN PODCAST and MY PULL LIST groups on facebook, and supermanpodcast on twitter. Episode #87: An Imaginary Summer Part VII: The Amazing Story Of Superman Red And Superman Blue! THE AMAZING STORY OF SUPERMAN RED AND SUPERMAN BLUE was originally published in SUPERMAN #162, July 1963, published on May 2, 1963. Edited by Mort Weisinger, the 32 page issue sold for 12 cents. The cover was drawn by Kurt Schaffenberger. The 24 page story was written by Leo Dorfman, pencilled by Curt Swan and inked by George Klein. This story was reprinted in the reprint editions THE GREATEST SUPERMAN STORIES EVER TOLD, DC'S GREATEST IMAGINARY STORIES and SHOWCASE PRESENTS: SUPERMAN vol. IV. To see page 2 of Curt Swan's art for I FLEW WITH SUPERMAN featured in Episode #61, go to: http://www.comicartfans.com/GalleryRoom.asp?GSub=47913 . Do a search for Curt Swan on this web site to see a wide variety of Curt Swan art. Episode #86: An Imaginary Summer, 2009 Part VI: The Death Of Superman! If you would like to read this story for yourself before listening to this episode, it was reprinted in THE GREATEST SUPERMAN STORIES EVER TOLD, DC'S GREATEST IMAGINARY STORIES and SHOWCASE PRESENTS: SUPERMAN vol. III. 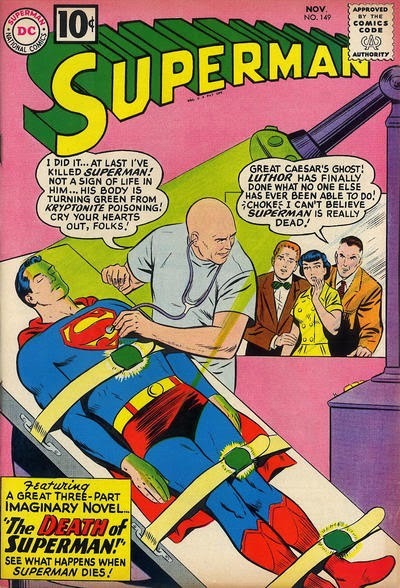 There were also two other Superman stories titled THE DEATH OF SUPERMAN. Neither of them were labeled as "Imaginary Stories". The first was published in ACTION COMICS #225, the first story of the issue. The twelve page story was pencilled by Wayne Boring and inked by Stan Kaye. The writer was unknown. The second story appeared as the third story of SUPERMAN #118, January 1958, published around November 7, 1957. The writer was unknown and the artist was Al Plastino. There is no reprint information about either story. 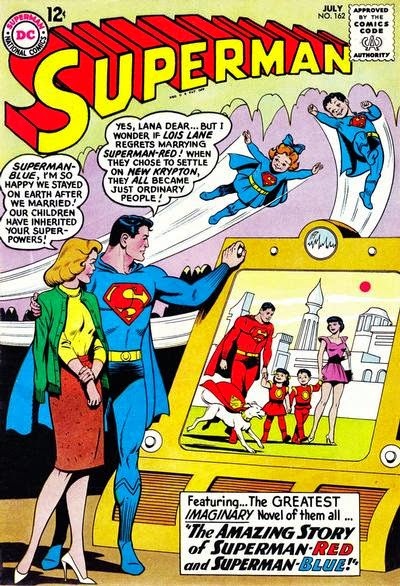 Next Week's Final Imaginary Story of the summer: THE AMAZING STORY OF SUPERMAN RED & SUPERMAN BLUE! Episode #85: An Imaginary Summer, 2009, Part V: Superman: Speeding Bullets! SUPERMAN: SPEEDING BULLETS was one of the first DC Comics ELSEWORLDS title about Superman. It was published on September 14, 1993. Its cover price was $4.95 and contained 48 pages. Mike Carlin was the editor. 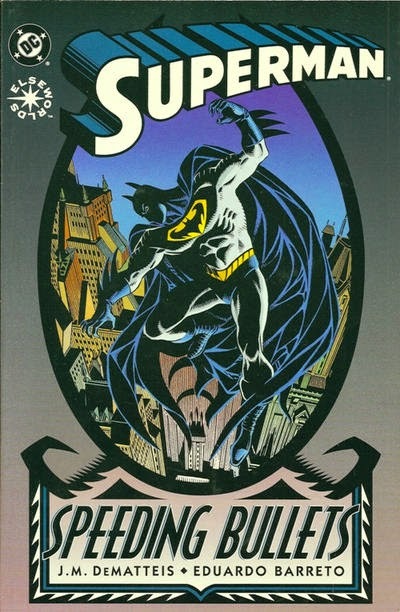 The cover and story was drawn by Eduardo Barreto, written by J. M. DeMatteis and colored by Les Dorscheid. There was no information about the letterer. No reprint information was available. Look for this one issue story in the back issue bins of your local comic bool store, or a vendor on the internet. Nest week's imaginary story: THE DEATH OF SUPERMAN!